The month starts with a just-past-full moon and ends with a just-before-full moon making February a month without a full moon. A lunar month is 29.5 days. Because February has only 28 days (or occasionally 29), the entire month often passes without all four moon phases represented. In 2018, it just so happens that the full moon is blocked out by the time constraint. Last quarter is on the 7th, new moon on the 15th, and first quarter on the 23rd. 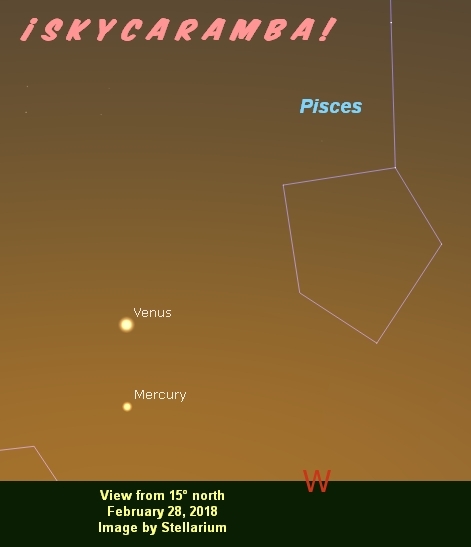 Venus is barely an evening object when February begins. It’s moving eastward, but not quickly enough to make a lot of progress against the later sunsets for watchers in the northern hemisphere this month. It will pass through Aquarius and head toward Pisces. Pisces is high in the west at sunset. Orion is high in the east. Our morning sky is graced with Jupiter in the diamond of Libra this month. Mars starts February next to Acrab in Scorpius while Saturn is at the top of the teapot of Sagittarius. Watch Mars pass a few degrees north of Antares at the base of Ophiuchus on the way toward Sagittarius. Mars will meet up with Saturn at the end of March and the start of April. Use February to watch the journey. Mercury, ever hard to spot, doesn’t put on much of a show this month. After going through superior conjunction on the 17th, it emerges in the evening sky toward the end of February. It’s poised to join Venus in early March. There’s a partial solar eclipse on the 15th. 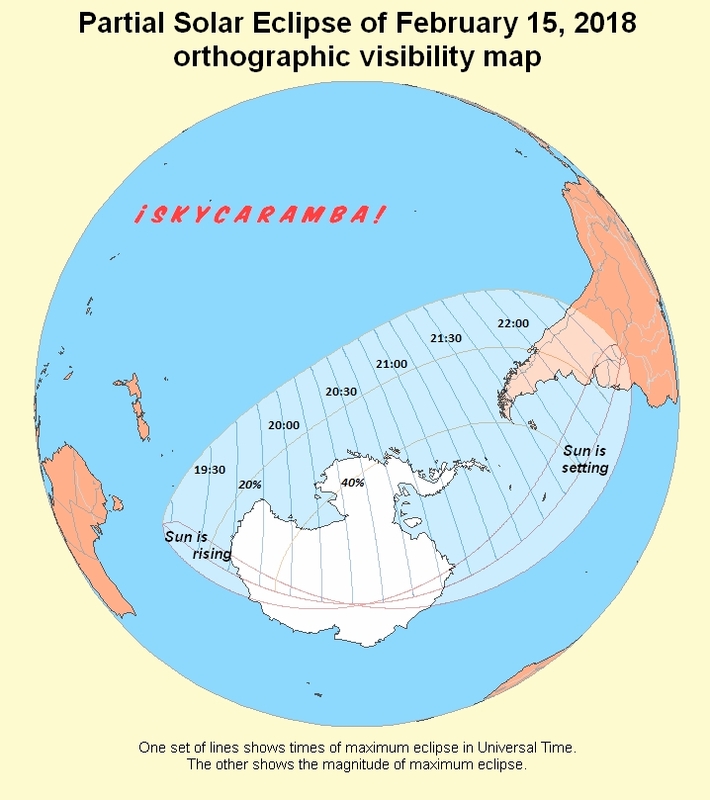 Viewing is from southern South America and Antarctica. The moon is 4.1 degrees north of Jupiter on the 7th. On the 1st, the moon will occult Mercury. Northern parts of Asia, Europe, and Greenland get the view. So does the Arctic.